Who are the designers leading the way in diversity this London Fashion Week? London Fashion Week is traditionally seen as having the upper hand over New York, Paris and Milan in terms of how forward-thinking, fresh and cutting edge it is. This might be so, but it’s sadly not leading the charge when it comes to diversity. According to the Fashion Spot, last season New York Fashion Week came in top with 37.3% of models being people of colour, while London was at 34.8% (let’s not even talk about the dire statistics of Paris and Milan which came in at 31.1% and 27.1% respectively). The UK’s capital might be host to some of the most exciting designers and trends, but it’s still got some work to do to equal (and then better) New York. Luckily, it’s not all bad – here are some of the designers who will be showing at London Fashion Week who aren’t totally terrible for diversity, and are well worth keeping an eye on. The Ashish show is always a sheer delight because of just how much designer Ashish Gupta adores sequins. Not only are her shows ethnically diverse, but last year she did something almost unheard of during London Fashion Week and cast an older model. Rocha won huge amounts of praise for using septuagenarian Jan de Villeneuve in her show, and is hopefully paving the way for more big name brands using models that are (gasp) over the age of 25. @britishvogue @britishfashioncouncil #voguefashionfund judging day with my beautiful women. Inspiring to meet amazing judges @edward_enninful @97crush @sarahmower_ @erdemlondon @jourdandunn @gemmametheringham at @labelmix @sarahmanley at @burberry @hdavidlondon @harrods @paulpricelondon at @topshop @mrsrodial and Xia Ding at @jd_corporate and designers @marques_almeida @mollygoddard @lekilt @huishanzhang @davidkomalondon ❤️ Thanks for the great day! Rejina Pyo only recently starting showing full catwalks at London Fashion Week instead of presentations, and is well worth keeping an eye on. The Korean-born designer got her MA at Central Saint Martins, and her feminine tailoring has become a fast favourite among fashion influencers. From the beginning she’s been keen on furthering inclusivity, putting out a casting call last year “looking for confident, unique and inspiring women of ALL ethnicities and ALL ages”. CASTING CALL We are looking for confident, unique and inspiring women of ALL ethnicities and ALL ages to participate in a very special paid project for Rejina Pyo in London on the 19th of September. We will be inviting a shortlist to a casting to meet the brand the week before. If you would like to be considered, please email us some clear face (no make up, natural light) and body photos, your age and your height to rejinapyocasting@gmail.com. We look forward to hearing from you!⠀ Tag anyone you think would be interested! 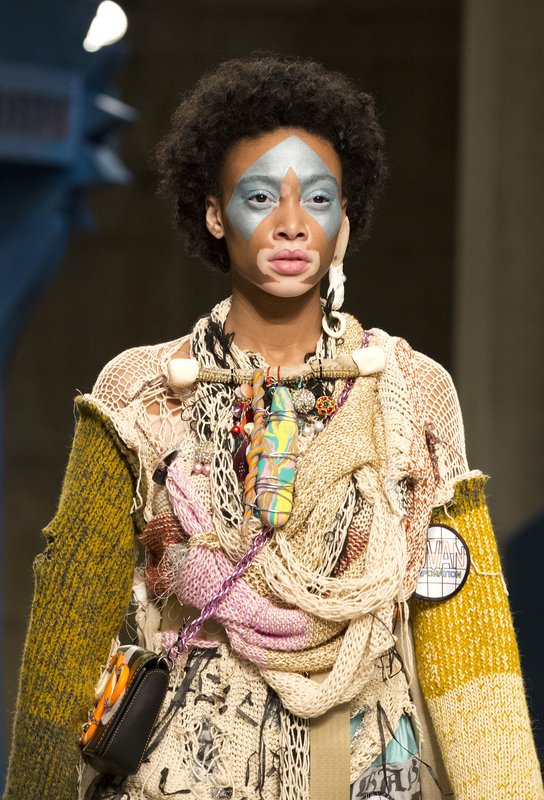 Central Saint Martin’s alum Matty Bovan could never be accused of being conventional. Even though he’s one of the most exciting names in fashion right now, the Yorkshire-based designer moved back into his mum’s house after graduating in 2015 to save money. He also isn’t really into mass production and tries to make everything himself – hardly characteristic of top designers. Bovan is unique in many ways, and one of these is how diverse the models in his shows are. It’s not like Bovan’s filling a quota or patting himself on the back for inclusive casting – he’s just reflecting the world around him. And who wouldn’t want Winnie Harlow opening your fashion show?